Product #20888 | SKU SAROD1200A | 0.0 (no ratings yet) Thanks for your rating! Provides the powerful lows that allow you to feel the bass. The Samson Auro D1200 700W Active Subwoofer provides the powerful lows that allow you to feel the bass. 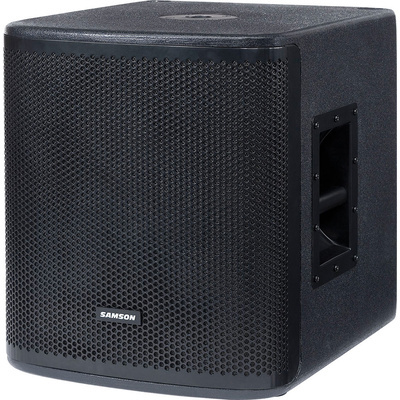 With a lightweight, compact Class D amplifier design, this subwoofer packs the heart thumping power you need into a more efficient enclosure ideal for fixed installations, musicians, DJs and sound reinforcement applications. The 12.00" (30.48cm) extended low frequency driver and a built-in amplifier produces 700W of power. Power, signal and limiter indicators offer constant monitoring of the amplifier. A variable crossover frequency control allows you to use the subwoofer’s XLR-1/4" combo input, as well as its parallel XLR outputs, to run your satellite speakers or daisy chain with additional subwoofers. The phase switch ensures that the subwoofer is in phase with the rest of your PA system. A roadworthy design, the subwoofer is constructed of solid 3/4" plywood with a professional textured finish. The enclosure also features two large ergonomic carry handles that make transport a breeze, as well as a 1-3/8" pole mount receptacle. Easy to move and built to last, the D1200 subwoofer provides a super tight and punchy low frequency output that completes your Auro PA setup.